Walking Mill by Fritz Leiber from Bread Overhead! The ultimate combine - giant metal centipede walks through fields, harvesting wheat, threshing, grinding and finally baking bread right in the field. As a blisteringly hot but guaranteed weather-controlled future summer day dawned on the Mississippi Valley, the walking mills of Puffy Products ("Spike to Loaf in One Operation!") began to tread delicately on their centipede legs across the wheat fields of Kansas. The walking mills resembled fat metal serpents, rather larger than those Chinese paper dragons animated by files of men in procession. Sensory robot devices in their noses informed them that the waiting wheat had reached ripe perfection. As they advanced, their heads swung lazily from side to side, very much like snakes, gobbling the yellow grain. In their throats, it was threshed, the chaff bundled and burped aside for pickup by the crawl trucks of a chemical corporation, the kernels quick-dried and blown along into the mighty chests of the machines. There the tireless mills ground the kernels to flour, which was instantly sifted, the bran packaged and dropped like the chaff for pickup. From Bread Overhead!, by Fritz Leiber. 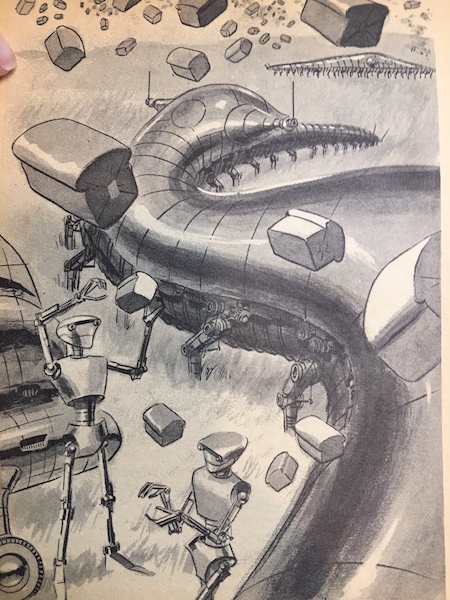 Compare to the factory crawler from Dune (1965) by Frank Herbert, the walking fort from The Killing Machine (1964) by Jack Vance, the centipede-machine from Monsters of Mars (1931) by Edmond Hamilton, the robass from The Quest for Saint Aquin (1951) by Anthony Boucher and the centipede from Killing Titan (2015) by Greg Bear. More Ideas and Technology from Bread Overhead! Tech news articles related to Bread Overhead!